On September 20th, the strongest hurricane to hit Puerto Rico in 85 years battered the island. Two months later, only 46.6 percent of Puerto Rico has power. There are those participating in the relief efforts, including Hamilton creator Lin-Manuel Miranda, who suggest that the relief efforts in Puerto Rico are sluggish compared to other recent disasters. These advocates are urging that Puerto Rico receive the same degree of assistance as any US state, given its status as a United States territory. Although this case is decidedly politicized, it illustrates an all-too-common response to disasters: The initial outpouring of altruism immediately following a disaster slows as people move on to their next concerns. 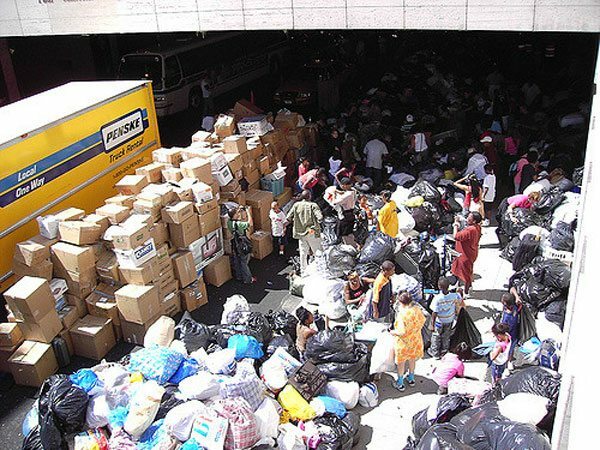 After disaster strikes, when heart-wrenching images fill newsfeeds, people often wonder what they can do to help and either dig deep into their wallets or into their closets to find items to donate. When a disaster strikes, the news is briefly dominated by stories and images of destruction. Heartstrings are tugged by stories of those impacted by the tragedy. Some make in-kind donations of things they think victims could benefit from. These donors mean well, but often their contributions are not items that are needed, so they create a logistical nightmare of sorting, shipping, and often disposing of these items if they are deemed unfit for redistribution. Instead, in-kind donors should give only those items that are listed as needed by organizations. Unfortunately, donations, monetary or in-kind, are hardly sufficient to solve the problem, especially in places like Puerto Rico where the already unstable infrastructure will require billions of dollars and years of work to repair. When Mother Jones asked readers what they wanted to know about Hurricane Maria’s impact on Puerto Rico, the most common response was, “How can I help?” When faced with human tragedy, donors are quick to jump in during what they see as the time of direst need: directly after the event. But the need does not cease once the news cameras turn their lenses to the next disaster. When Mother Jones asked experts in the relief field for guidance in how to be of the most help after a disaster, the most important takeaway was that it is never too late to help. There are four phases of disaster relief: immediate, intermediate, long-term, and disaster preparedness. While many generous donors give immediately after a disaster to provide for the acute needs of those impacted, it’s the continuing efforts of governments and nonprofit organizations focused on rebuilding that help the most. Donations made in the early stages of a disaster are usually restricted to relief efforts; donors want their funds to be utilized directly for that disaster, making those donations less flexible. In the months and years following a disaster, the need for more flexible, unrestricted funds rises as aid organizations provide ongoing support. Donors who still wish to help in the recovery effort for a particular disaster may consider earmarking their funds for the region rather than an isolated incident to ensure that relief efforts can stabilize the area for the long term. As a recent report by the United Nations illustrates, disaster victims continue to suffer for years afterward. Although it has been seven years since the massive earthquake in Haiti, yet another disaster that spurred an outpouring of donations, there are still over 2.5 million people in need of aid even as the administration has made the decision to lift the Temporary Protected Status of those who fled to the United States in the wake of the storm. After the last aftershocks quieted down, the worst cholera epidemic in recent history hit the country, adding enormous strain on the already overtaxed healthcare system. To add insult to injury, trusted international humanitarian organizations like the Red Cross have been accused of mismanaging donations, notoriously building just six homes with half a billion dollars. When news organizations move on to the next story, it is important for donors to remember that disasters are often recurring and their impact is rarely limited to the disaster itself. An area that is vulnerable to flooding or earthquakes or fires will continue to be vulnerable, especially if meaningful improvements are not made to the existing infrastructure to prevent further disaster in the form of retrofitting or levee repair. That is where donations made in the later phases of relief efforts come in. We’ve all heard the tales of parkas sent to Haiti when cash would be far, far more helpful. As hurricane-struck communities face rebuilding efforts, can nonprofits do better at moving donors to send cash this time?